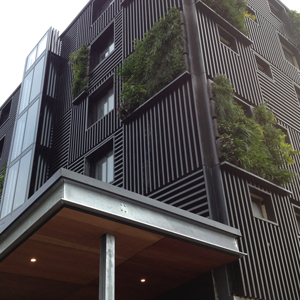 The Supabatten System from MetalART Industries was specified by the award-winning Brenchley Architects for Channel 9’s The Block Sky High program. According to architect Julian Brenchley, they were looking to add dramatically to the thermal mass of the building situated at 142 Park St, South Melbourne, and also add an external skin to the building for the 2013 season of The Block Sky High. The function of the external skin is to heat up and cool down during the normal course of the day. The external skin varies in temperature but the inner separate brickwork wall remains within a static or stable temperature range, alleviating the need for extra 'conditioning' of the internal air to maintain an acceptable temperature range for comfort. The appealing features of MetalART Industries’ 150 x50mm Supabatten aluminium screens satisfied the criteria required for this essential aspect of the project. Choosing to work exclusively with MetalART Industries’ custom metal fabricators in Melbourne, they were able to give the building a face-lift and install an external skin to the existing building. The added benefit of the external second skin, the Supabatten System was to conceal the ugly building behind. Over a period of a few months, Brenchley Architects worked with MetalART Industries, developing ideas and assessing material choice, facade panel prototypes, and fixing methods on site to see what was practical and achieved the desired external appearance. The Supabatten System was selected and installed, resulting in an amazing final outcome of the facade and cladding 'second skin', from aesthetic as well as performance perspectives.